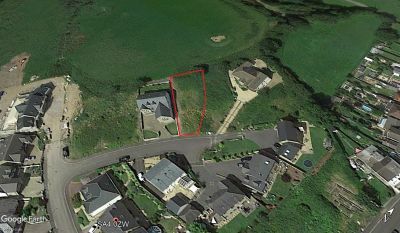 Located within this prime development, surrounded by Executive style homes, an elevated parcel of land, taking full advantage of the panoramic views toward Swansea, Llanelli and Ammanford. The plot has a maximum width of approximately 15.5m (51ft) and a maximum depth of 35m (115ft). Detailed Planning Consent has been granted, by Carmarthenshire Council for the construction of a detached dwelling with integral double garage. The Planning Application and associated documents can be viewed online by visiting www.carmarthenshire.gov.wales/planningapplications - Application No. S/12655. We are advised that there are all main services to the site via the footpath abutting the plot, and that Building Regulations have been approved.